Rebecca Doll | Rebecca Doll - at work, at home, at play: learning things the hard way! When Sam was here, we had a conversation about “what comes next”. Sam is from Vancouver and was on a Katimavik program, the LAST Katimavik program thanks to an unfortunate and pervasive worldview that is so focused on survival that it forgets to ask what we are surviving for. Sam is remarkably aware and well-grounded for an eighteen-year old and I can’t help but think that the course of his future and those he connects with is altered by his participation in programs like Canada World Youth and Katimavik. The nice thing about having people stay in your house, is that you can have conversations that extend of over many days, interrupted by life’s activities and with opportunities to think or learn between each chapter of the conversation. One such overlapping conversation was about What Comes Next. What Came Before is best illustrated through architecture in as much as it represents forms of governance. It is probably obvious that the concentration of power of any given period in history can be identified by the largest buildings; the clan Chief’s hut, the Church, the King’s Castle, the Parliament House, the Bank. I think what is true in our time, that might not have been true in past times (though it may have been) is that while we can see that the banks are the biggest buildings, we want to believe that Parliament is still the seat of power. So the question is, after banks, as a representation of corporate power, what comes next? Evidently, something always comes next. I live in an area of Hamilton where there is a lot of talk about folks living paycheck to paycheck, but when I look at how many houses in Toronto cost a million dollars or more, I think many of the folks at higher income brackets are also living paycheck to paycheck. In both cases the people in question are in survival mode, and I have long felt that survival impedes evolution. It seems to me that we are in a time of transition, between this and what comes next. A time when values are being questioned and many people are seeking meaning. It seems that the legacy of a consumer society is that we are all left feeling like we are getting ahead, but in entirely the wrong direction. If we continue on the path that we are on, it looks inevitable to me that we will see a hardening of separation between us and them, whoever us and them are. In times that came before, accumulation of power has largely been geographically tied, but in a global economy, a global awareness, it seems that this separation must necessarily be vertical, played out in terms of dollars and cents, separating those with more from those with less. Of course, here in Canada, our cents are being eliminated as the absence of them has more value to those with dollars, the the cents do to those without. At the same time I see a growing alternative to what comes next, a contender, if you will, that embodies values such as local, organic, sustainable, environmentally responsible, inclusive, innovative, creative, community. It is a movement that values living, and not just surviving. I see these values being shared by different groups, each with their own emphasis; some of them are churches, some of them are environmental organizations, some of them are financial trusts and some are municipalities. Luckily, the same tools that make global super powers possible, are also making local-interconnectedness possible. This is what Sam and I discussed during his visit. As we tried to ponder the kernel of what unifies these groups and movements and differentiates the direction of this alternative future from the path that we are on, I think it could be summed up by the idea that we will only go as fast as our slowest member. Our slowest member might be a person, or it might be the vast tracts of arable land trying to remember what real seeds are. Necessarily then, such a transition is slow, but I believe as relentless as nature herself as each person, each group, sows the seeds of our shared future. Having a not so common name, I don’t have a lot of real life experience with other Rebeccas, much less Rebecca Dolls. When I was first introduced to Facebook it took me about a week to understand what was going on and I’d only just gotten used to it when I received a message from Rebecca Doll, entitled, “Rebecca Dolls of the World Unite!” The exclamation mark alarmed me. This set me back about six days in my learning as I tried to puzzle out whether this was a real person, a Facebook program, or if somehow I myself had done this. I was finally brave enough to write back and discovered a twenty-year old in the UK who was searching Facebook for all of the Rebecca Dolls. This was a whole new perspective for me as until then, I’d thought I was the only one. This young explorer found about thirteen others, six of whom agreed to join her group. We are still Facebook friends and I have watched her get pets, get married, get jobs, vicariously learning about a different world than mine. Modern pen-pals I suppose, though the interaction is indirect. Later, through my Google Alerts, I discovered two professional Women in the US, and I have notice that between the three of us, most Rebecca Doll urls are one of us. Though we don’t know each other, I feel a strange kinship. Do the John Smiths feel the same way about each other? There is another Rebecca Doll, the famous one, but she is made of porcelain. Because of her I get notifications like “Rebecca Doll for sale, cheap, cheap, cheap!” This one helps me not to take myself too seriously. Somehow this feels like a metaphor for balancing personal identity with community identity, personal needs with collective needs. It makes me think about having the same passions, goals or spheres as others and about how we co-exist. Really, we should all “Unite!”. I remember when computers used to say that all the time: searching… searching… and some little icon would be moving, indicating the passing of time and hopefully keeping us from bonking the machine on the head when we got impatient. 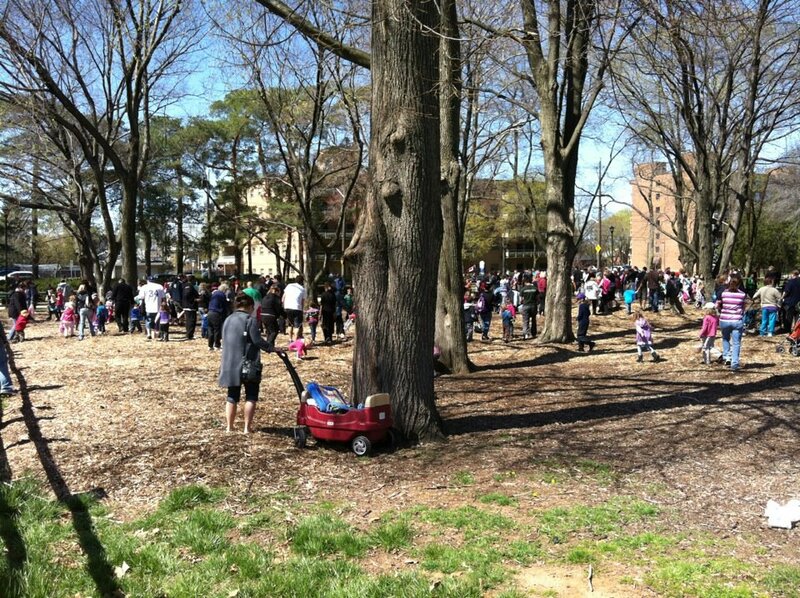 Today we had an Easter egg hunt in the neighbourhood. A lot of people came. In fact, there was almost nobody that I knew, which is refreshing. Makes the world feel bigger. A local philanthropist donated 4000 eggs and my big worry was that we’d be combing the park till the wee hours cleaning up all the eggs that nobody found. In fact, there was a stampede about 7 minutes before the advertised start time, as soon as the first location was leaked, and most of the people had been satiated and were packing it in 7 minutes after that. The diehards searched for another twenty minutes and then the only thing to be found were people. In the old school way of reckoning the event was a success, to judge by the numbers, but to me it felt more like a beginning. To me, the measure of success is what people get out of it, which is really hard to measure. Did they make new friends? Did they meet new people? Did they feel like pitching in next time around? A few did. Some folks with suggestions and skills are coming out to help with the next one and ideally, we’ll start planning for next Easter round about now. I couldn’t help but think how we are all searching for more than just chocolate in this very busy world, but there is nothing like chocolate to catalyze that search. Maybe next year we’ll have a couple of things out there in plain sight, like a lemonade stand, to help us help each other to find what we’re looking for. There are still a lot of people believing that the Occupy movement is just a bunch of hippies and cranks. In fact, those folks sitting on cold concrete are sitting on the front lines of a civil war, and they are there for you and me. There has been a lot of attention paid in recent years to our soldiers overseas, to their families, to acknowledging their sacrifices and expressing gratitude. It is something we don’t always think of. We need to think about the people who are suffering for our rights here at home too. People are what’s important. Policies should serve the people. When they no longer serve the people, they need to be changed. The occupy movement is about changing a few basic laws to re-align our finance and governance systems so that it is a fair playing field for everyone. This is not a fight between Joe Jobber and Marty Millionaire. There will always be people who surpass others, whether it is at making money, playing soccer or singing opera. But right now the deck is stacked in Marty’s favour, and really, if he’s that good, he should be able to succeed on an level playing field too. We all act in our own self-interest. I think that instinct helps to keep us alive. Many self-aware people might go so far as to admit that if they were sitting on top of a system that was tilted in their favour, then they might well favour the status quo too. That the system is tilted, we all feel. Even though you feel the tilt, does that mean you want to go sit on cold concrete to change the system? Probably no more than you want to join the army. But that tilt is bad for all 100% of us, and the Occupiers are trying to do something about it. I’m guessing they have already tried everything else before camping out on the street. Wouldn’t you? There is something we can do without being on the front lines. Keep your mind and heart open. Honour the people who are sitting on the concrete, collating information, innovating solutions, communicating with the world, co-creating a new system that you and I will benefit from even if we don’t wear placards. Honour them even if they are hippies and cranks, because historically they are the ones who show us the way. This is not just a US civil war, but a global transformation. It isn’t going to end. It doesn’t have to be violent. As far as I can see, the violence isn’t coming from the 99%. There are much better ways, but as you can imagine, they require communications. Don’t let yours be muffled. The biggest news of the decade (that you probably haven’t heard) is how Iceland just went through the same thing, successfully, and came out with a new financial system, a new government and a new lease on life. You can bet it wasn’t easy. In the US there is already an online movement that is working on re-drafting the relevant laws/policies/procedures that would fix things, but I have lost the link. If you have it, please pass it along. If you understand laws and money and want to be part of that, please do: the beauty of democracy is the many-flavoured voice that emerges. I have not seen those efforts yet in Canada, but we need work people. We need an open, collaborative discussion about how to fix the system. If you have not yet watched this slide show to understand specifically how it is broken here in Canada, do it. It starts with our monetary system and ends with you saying “In Canada! ?” We have such and interesting low/high self-esteem complex here. If I was Marty Canada, seeing the writing on the wall down south, I’d stash a little nest egg somewhere and say “ok, ok, let’s rewrite the rules”. Resist the temptation to think that this movement is all nonsense that will blow over, or that it is all stupid people who should have known better or who took risks you wouldn’t take. Think of Iceland. This is the most important thing happening in the world right now. We all need to start voicing our thoughts. We need to be part of our own future. And if you are in office representing people, or are thinking of doing so, remember that people are what’s important. Sometimes a person is so good at what they do that they make it look easy to the rest of us. Makes us want to do it too. When Glenn Lowson first discovered the Heart of the Hammer not long after it opened, he caughtoned on fairly quickly to the whole people-oriented thing and so he paid it forward. He bought a coffee for the next person to come in after him. But then, that person did too! And so did the next and so on. This lasted for seventeen days until someone said “Wow! Thanks!” and enjoyed a coffee on Glenn. So he bought another coffee and paid it forward. Eventually I made my way to Glenn’s website and the first thing I checked out were the celebrity photos, but you know, we’re used to seeing good photos of celebrities, so this mostly spoke to me of access rather than ability. Then I looked at the Education and the Business photos and I started to appreciate the skill and talent in the photos. The artistic quality. The art direction as well as execution. That’s when I started to call him our Big Time Photographer. To tell you the truth, I was a little surprised that he lived down the street. But then, I started to meet all sorts of talented people who lived down the street. When Glenn started working on his Heart of the Hammer exhibit, and then his yet-to-be-exhibited Hammer Heads, I came to appreciate his particular skill with lighting. And then, there’s his bed-side manner. Watching him take so many portraits at the cafe I saw subject after subject blossom in the warmth of his light and the care of his attentions and I came to see how he managed to get such great photos, even out of celebrities. Lately, Glenn has taken some World Class photos for our neighbourhood newspaper, the South Sherman Hub News, and in the process put up with our (ok, my) inexperience graciously, giving the effort the same skill and attention that is evident in all of his work. Perhaps it is for this reason that we now call him our World Class Photographer. Or perhaps it’s because he really is the best darn photographer the discipline has ever seen. The first book I ever wrote I plagiarized. It was grade one or two and it was about hippos or something. Complete with traced images. Not sure how the teacher fell for that, but there was no joy in it. I guess I felt that I needed to be better than I was. Maybe that’s what school does to us. Or life. When I was finished high school, the first time, I moved out to Kensington Market with a friend. I sat there in my attic room with all the junk I’d taken with me, wondering what I would do for a living. I really, really, really enjoyed the biology, chemistry and physics that I’d been doing the last few years of high school, but I realized that it took me five hours of homework every day to stay on top of it. I wondered if I liked it enough to do that for the rest of my life. I had a pilot license, but for some reason had let myself be talked out of the practicality of being a commercial helicopter pilot. What a shame, in those days I would have enjoyed the survival training in the arctic, but nowadays I think I enjoy my Beanermunky lifestyle too much to do that. As I sat around pondering “What do I do already?”, I realized I was sitting there amid boxes and boxes of writing. Writing that didn’t amount to anything but suggested that it was something that I liked to do. Possibly to the exclusion of everything else. In those days, the only creative writing program I could find was Playwrighting, offered through Concordia University. It was a blended degree in Theatre and English and while I learned so much about writing from English, I learned so much about characters and people through theatre. After that and during that time, I studied writing through colleges, universities, private tutorials and summer programs wherever I found them. Once I felt that I was trained and competent to write, I realized that I had nothing to say. This was a surprise. I spent several years writing for others; persuasive letters, grant applications, project proposals and weird things like the 400-page Chicken Report. I had no voice of my own. At intervals, I have taken hiatuses from job jobs, declaring that “I am a writer!” and then I realize that it’s pretty darn lonely sitting by yourself all day, every day. Meanwhile, the boxes of writing multiply. A few years ago, I found my voice. Maybe it was hiding around the corner from 40. Or maybe it was being around people who valued my voice. Since then, I have tried to find my truth and speak it, sometimes even when it doesn’t want to be heard. I have this idea that our thoughts are powerful. That they create our visions, goals, dreams, shape our thinking and lives, affect our confidence. I have this idea that spoken word is even more powerful, that it impacts others so immediately, shapes our relationships, shares our energy, communicates the thoughts in our heads. I have this idea that written word is an even higher level of commitment than speaking, that it shapes our world, our reality, the agreements of our co-existence. What if the auto industry embraced a social enterprise model? What if the tax breaks, incentives and bail-outs that this industry received were predicated on the idea that ‘profits’ were being reinvested into the organization and not being given out as bonuses? What if only companies that were not-for-profit were able to receive such sponsorship from the government? I think we would find that many not-for-profit industries, like the arts, employ more people per gov dollar and make a dollar go a lot further than the industries that we like to imagine are efficient. Like the auto industry. The often touted reason for private sector bailouts (jobs) produces rather fuzzy math indeed. A social enterprise auto company would have been reinvesting the profits into the organization for years, (think environment, think r&d) and would likely be far ahead on electric car research or have saved their own funds to do so or would be receiving research grants knowing that the future profits were once again being reinvested. The issue here is not the auto industry, or even the arts industry, it is the notion that very large amounts of public money are given to the private sector with the clear understanding that they will produce profits for very few individuals. How do we fault the people receiving the money if our system allows it? Why do we continue to build a system that allows it?